The great mountains — the so-called sacred roof of the world — called me again to their power and embrace. Over the last decade, I have met with the Himalaya in Nepal, China, northwestern India, and Sikkim. In the spring of 2012, I energetically guided and co-adventured, with my best friend, on a spiritual quest to the Khumbu region of Nepal, southwest of Sagarmatha (Mt. Everest), and to western Bhutan. Some trips are planned, and some trips plan you. We were guided into the less-trekked valleys and routes of this region by the dreams and visions of my friend, rooted in his spiritual lineage and ancient memories. We continued a trek that was begun long ago … and rejoined the ancient energies of this area across the Three Valleys of the Khumbu (Bhote Valley, Gokyo Valley, and the valley leading to Everest base camp). It was the highest elevation of my life — reaching 18,600 feet (5600m) at Kala Pattar and crossing two snow and glacier-covered passes just below 18,000 ft (5400m). Two blizzards and many days that did not reach above freezing made for the most challenging journey to a sacred energy site of my life. While Paul did not accompany me physically on this trip, he resolutely provided the “energetic base camp” at home — and experienced much of the journey through our vibrational connection (which made for many sleepless nights for him, with the time zone difference, as we crossed the mountain passes). The two of us trekked without local guides or porters. Which meant that we carried ALL of our clothing (and my camera equipment) — about 40lb backpacks each, stopping for the night in local villages for simple, unheated shelters, and meals of rice and lentils. While I have hiked and backpacked thousands of miles across all continents except Antarctica, this trip — with the triple demands of altitude, relentless cold and snow, and high vibrational energy work — fully tested my commitment to bring forth the healing ceremonies for this region and Earth’s ascension pathways. After 140 miles of hiking, culminating with the April 7 full moon over Chomolunga (Mount Everest), I returned to Kathmandu with many photographs and about 10 pounds less bodyweight. The Shift of Energy from the Himalayas to the Andes? Much has been said about the shift of sacred energies from the Himalayas to the Andes for the new planetary future. 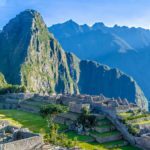 (I embarked on a journey to Andean sacred sites in Peru and Bolivia in subsequent months to see for myself.) The alignment of my two mountain pilgrimages was remarkable. About a year earlier, I reflected that I would like to return to both the Andes and the Himalayas in 2012, to see how the expanding cosmic energies, and elevating planetary frequencies, were changing the vibrational matrix of these places. While there may be cultural shifts and movements, now and in the future, I experienced the generative energies of Terra (Earth) — in reflection of these sacred, powerful, and immense mountains — to be alive and flowing. Without diminishment or distortion, as I have experienced in many other places, and quite unexpectedly, throughout my subsequent travel to sacred energy sites in the Andes. Much is changing, but the deep, luminous, and life-giving energies of this area continue to offer themselves to planetary evolutionary pathways. And, having stood at many of the most powerful energy nodes and sacred sites of Terra, I can say from the heart and soul of my being, nothing compares to the glacial valley immediately at the base of Chomolumnga (Mount Everest). 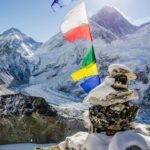 Chomolungma, and the gathering of Pumo Ri, Nuptse, and Lhotse, are great mountain beings that incomparably co-create one of the highest vibrational energy sites of Earth. As we trekked, contemplated, and connected, I met with what I came to know as the great “mountain goddesses” of this region — Cho Oyo, Pumo Ri, Chomolungma — for many weeks, day and night. Not only in their visual presence, but encountering the vastness of their higher vibrational aspects. There is much more than meets the third dimensional eye in these mountains and valleys. In fact, to perceive the landscape as simply mountains completely misses the true grandeur of their presence and gift to Earth. After being present with the sacred mountains — experienced from my heart and eyes in the higher dimensions as more like mountain goddesses — it seems inconceivable to “climb” them and truly see them. While the epic mountaineering feats in these mountains are stunning for their endurance and human perseverance, such a raw physical experience is a very different pathway than witnessing their higher vibrational nature and offering to life on Earth. Over and over again, it struck me how the Himalaya defy spiritual stereotypes and expectations. Quite often, mountains, and the Himalaya in particular, are portrayed as centers of masculine energy. This, in part, contributes to the observation that sacred, generative Earth energies are shifting from the Himalayas to the Andes, as I reflected upon above. The awakening of the Divine Feminine — in my eyes as a cosmic principle of creation beyond gender — is an elemental part of the ascension pathways as patriarchal and controlling influences are released from personal and planetary energy systems. So where do the energies of the Himalaya fit into this past, present, and future? A core distinction must be made between 1) third dimensional (cultural and physical) geography and 2) the higher dimensional essence or source energies of a place. It is surely arguable that the mountain terrain, and historical religious traditions that emerged from the Himalaya are dominated by patriarchal structures and an emphasis on the masculine creative principles. BUT this is a lower dimensional reflection — and one could say a distortion or ignorance — of the higher vibrational energies and aspects at the heart of the sacred Himalaya. 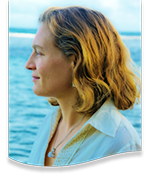 When I explored and co-created — in deep meditation and healing ceremonies for the land and energy ley lines — with higher dimensional aspects of the Himalaya, I experienced the empowered and powerful Feminine. My trekking companion (a male and monk of many lifetimes) and I both recognized the great mountain beings as reflections of the awakened and empowered Divine Feminine — goddesses of this place, metaphorically speaking, not gods. After many weeks and miles of deep observation and reflection, I concluded that the Divine Feminine generative energies of the Himalayas are a powerful and elemental part of ascending Terra and planetary consciousness. The “energetic shift in location” is occurring WITHIN us, to see through multi-dimensional vision, beyond the cultural and apparent physical structures, to the deeper essence of Terra and higher vibrational futures. The sacred essence of the Himalaya — in a dimensional existence far beyond rocks, snow, and ice — emanate and activate multi-dimensional, healing sacred geometry of creation, renewal, and rebirth, to foster the present and future of high vibrational Terra, as they have for millennia. While certain energy streams are coming to an end, no doubt, others are originating, and continuing the evolutionary pathways for land and Spirit … in the Himalaya and beyond. After the Nepal earthquake ... and before the next?